Transforming innovation into effective solutions. Martec is able to assist you at any stage of your project. We work with customers whose requirements vary from concept through to qualification and acceptance, covering the complete development lifecycle, or one off custom developments. Our experience has taught us that successful engineering projects are the results of clearly defined objectives, effective implementation and attention to detail. Whether your project requirements can be fulfilled with standard products or your needs are completely unique, Martec will work in partnership with you to design a solution. We will be working closely with you to create a number of prototypes that meet all of the criteria specific to your project. After reviewing the prototype options we will develop the most effective into a fully functional product. 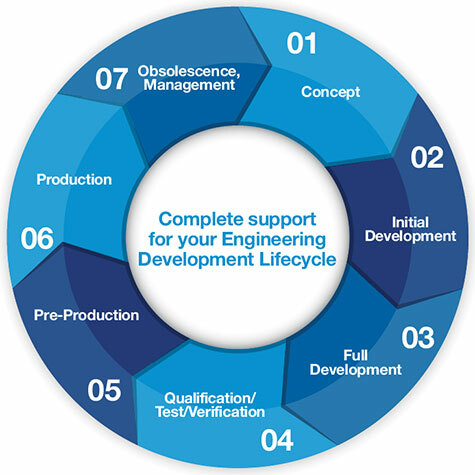 Martec can support your qualification and acceptance process through prototype testing and acceptance test reports. After our in-depth qualification phase, we will review all of our findings and support your product readiness reviews. Our expert team will manage the production process vigilantly. Martec can help obsolescence by ensuring alternative solutions remain fit for purpose. To find out more about the services we provide, please find our Materials Capability Sheet and top tips for specifying a Connector, Glass to Metal Seals and Coax Interconnects below. It is always refreshing to find a vendor like Martec that acts as a partner in the product development process. They have been responsive, show enthusiasm, and have demonstrated dedication in delivering a product that meets our needs and the needs of our end customers.